A Love Story for Valentine's Day - Marie Antoinette and Count Axel von Fersen - History? Because it's Here! Historians and biographers debate whether Marie Antoinette and Axel von Fersen were platonic friends or lovers. Only Marie Antoinette and Axel von Ferson know the truth, but the strength of their affection for each other resonates in their letters and the way they impacted each other’s lives. Marie Antoinette and Swedish soldier Hans Axel von Fersen were both still teenagers when they met each other at a masquerade ball in Paris on January 30, 1771. She was still the Dauphine and not yet the queen and Fersen’s military career had just begun. Born in 1755, he was part of the Swedish nobility, but served in the Army of France. Also born in 1755, Marie Antoinette was the 15th and favorite daughter of Maria Teresa, Empress of Austria. At age 15, Marie Antoinette was selected to marry the man who would later become King Louis XVI of France. When she moved to France, she wore clothing fashionable at the French Court and she immediately began to reconstruct her thinking to become more French than Austrian. At the ball, Marie Antoinette and Axel von Fersen took off their masks and talked to each other and that meeting began their friendship. She invited Axel von Fersen to Versailles and he quickly became one of her favorite guests. He traveled to Versailles as often as he could, but his military career soon transformed into a diplomatic post that took him to England for several years. After that, Axel von Fersen went to the American colonies where he fought with the Americans in the American Revolution. In 1781, he served as aide-de-camp to General Rochambeau and distinguished himself at the Siege of Yorktown. The Army promoted him to Colonel for his valor. In 1774, the Dauphin became King Louis XVI of France and Marie Antoinette became Queen of France. Most historical accounts indicate that their marriage wasn’t happy. The King had radically different interests than his Queen. He enjoyed hunting, quietness, and solitude. She enjoyed the arts, fashion, dances, and eventually politics. There is historical disagreement about their physical intimacy, but the general historical record says that it took seven years for the couple to consummate their marriage because the King had a physical problem. Finally, the King had an operation that corrected the problem and eventually the couple had four children: Marie Therese Charlotte, 1778-1851; Louis Joseph Xavier Francois, 1781-1789; Louis Charles, 1785-1795; and Sophie Beatrix, 1786-1786. In 1784, the Swedish government recalled von Fersen to Sweden. Most historians agree that Count von Fersen’s loyalty rested with Queen Marie Antoinette and French monarchy, even while he served his own King Gustav III. In 1790, King Gustav III sent Axel von Fersen to Versailles as a member of Sweden’s diplomatic corps. Axel von Fersen remained in Paris throughout 1791 and in this year he and Queen Marie Antoinette grew closer, and some historians assert that this is when they became lovers. By this time Marie Antoinette and the Royal family had become prisoners at Tuileries and Axel von Fersen had free access to the palace. Axel von Fersen and Marquis de Bouille created a plan to help the Royal Family escape their imprisonment at Tuileries. Disguised as servants of a Russian baroness, huddled in a coach that von Fersen himself drove, on June 20 and 21, 1791, the fugitives and von Fursen traveled toward the town of Montmedy in northeastern France. Montmedy was a Royalist bastion and the King hoped to launch a counter-revolution from there. The King and his family were arrested in the Revolutionary town of Varennes, not far from Montmedy, and returned to tighter security in Paris. The attempted escape sealed the fate of the Royal Family and strengthened the resolve of the radical Jacobins in Paris. For his part, Axel von Fersen wrote in another letter to his sister that he would never marry because the woman he loved was taken. In February 1792, at the risk of his life, Axel von Fersen returned to France with another plan of escape for the Royal family, but he couldn’t implement the plan. He also commissioned the drafting of the Brunswick Manifesto, threatening an invasion of Revolutionary France if the Royal Family was harmed, which a coalition of European powers signed. This action put the French Revolution on a war footing and inspired French patriotism and nationalism. It also made the King and Queen obvious enemies of the new French Republic and candidates for the Reign of Terror. On the afternoon of February 21, 1792, von Ferson paid and third and last visit to the Tuileries where he stayed until midnight in a final meeting with Marie Antoinette. After much difficulty, he reached Brussels on February 27, 1792. Marie Antoinette was guillotined on October 16, 1793. Count von Fersen survived the French Revolution, but in 1810, a Swedish mob beat him to death, inflamed by rumors that linked the Count to the death of the Swedish Crown Prince. Despite their violent deaths, the love of Marie Antoinette and Axel von Fersen had for each other was a peaceful haven in their tumultuous lives and deaths. Farr, Evelyn. Marie Antoinette & Count Fersen: The Untold Love Story. Peter Owen Ltd., 1996. Goodman, Dena and Kaiser, Thomas. Marie Antoinette: Writings on the Body of a Queen. Routledge, 2003. Haslip, Joan. Marie Antoinette. Grove, 1988. Loomis, Stanley. The Fatal Friendship: Marie Antoinette, Count Fersen and the Flight to Varennes. Davis-Poynter, Ltd., 1972. Von Fersen, Hans Axel. Diary and Correspondence of Axel von Fersen, Grand Marshal of Sweden Relating to the Court of France. Adamant Media Corporation, 2001. Zweig, Stefan. 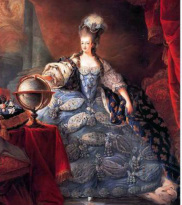 Marie Antoinette: The Portrait of an Average Woman. Eden Paul and Cedar Paul, Translators. Grove Press, 2002. Were Marie Antoinette and Count Axel von Fursen Lovers? For over two hundred years, historians, biographers, and ordinary interested people have debated whether or not Count Axel von Fersen and Marie Antoinette were lovers. Their contemporaries used the letters between them and the Count’s frequent visits to Versailles and the Tuileries to spread rumors about them that supposedly prove that the Queen was immoral and the Count intemperate. Later biographers and historians, using various documentations and perspectives have drawn their own conclusions. These are just a few of them. Simone Bertiere in Marie-Antoinette l’insoumise, says that their love was “a chaste love, if there was love at all. Vincent Cronin in Louis and Antoinette subscribes to the one night stand theory. Carolly Erickson in To the Scaffold: The Life of Marie Antoinette says that they were “very secret lovers. It seems appropriate to take the romantic view around Valentine’s Day and examine their actions. They met at a masquerade ball in Paris when both were eighteen years old and their relationship lasted until Queen Marie Antoinette went to the guillotine on October 18, 1793. Queen Marie Antoinette allowed Axel von Fersen to visit her in her apartments when she knew that the visits would cause vicious gossip. In turn, Count von Fersen tried unsuccessfully to rescue her and her family several times and guide them to safety. They left evidence of their affection for each other in words in letters as well as actions. Marie Antoinette and Axel von Fersen had much in common. They lived in the menacing shadow of revolution and they both died in the full glare of revolution. They both came from countries that revolution had turned inside out and where individual fortunes and often lives rested on the whims of popular sentiment and mob rule. Both were at the same time politically savvy and politically naïve. Despite his Swedish ancestry, Axel von Fersen identified more with France than he did his home country, and despite her Austrian origins, Marie Antoinette became effectively French in her sympathies and outlook. Both of their lives were shaped and ended by revolution in their adopted country, France. The forces that the French Revolution unleashed took the life of Marie Antoinette and her family and forever altered the course of Axel von Fersen’s life when Marie Antoinette was executed. Perhaps a combination of political sympathies and a realization of how revolutionary forces could shatter lives convinced Axel von Fersen to remain aloof from the Revolution of 1809 in Sweden. The 1809 Revolution deposed Gustav IV Adolf and Fersen sympathized with Price Gustav of Vasa, the son of Gustav IV, and he wanted the prince to succeed to the throne. The Swedish parliament, the Riksdag, elected Danish prince Carl August of Augustenburg to the throne and when the new crown prince died suddenly in Skane in May 1810, rumors immediately circulated that he had been poisoned and that Axel von Fersen and his sister, the countess Sophie Piper, were responsible, at least in part. The anti-Gustavian Press, and especially a fable called “The Foxes” maligning the Fersens which appeared in the radical newspaper Nya Posten helped create resentment and hatred against Fersen. The prince’s body was brought to Stockholm on June 20, 1810, and as Marshal of the Realm, Count Axel von Fersen received it and led the funeral procession into the city in his fine carriage. As the procession moved along the crowd began to attack von Fersen and he sought refuge in a house near the Riddarhus Square. The mob followed him, tore his clothes to pieces, and finally trampled him to death. Numerous troops stood by but were ordered to do nothing about the hour long riot or the murder of Count Axel von Fersen. The romantic, Valentine’s Day view of Marie Antoinette and Count Axel von Fersen is that they were soul mates-mentally and spiritually in tune with each other. They shared good times and hardships which brought them closer together and they were havens for each other in lives full of tumult and trial. The documentary evidence unmistakably indicates a deep friendship. Whether or their relationship turned physical enters the realm of speculation based on the interpretation of documentation. Around Valentine’s Day, it’s more romantic to remember that on February 21, 1792, Axel von Fersen risked his life once again for Marie Antoinette. He paid a third and last visit to the Tuileries where he stayed until midnight in a final meeting with Marie Antoinette. A Valentine’s Day romantic believes that yes, indeed, Marie Antoinette and Axel von Fersen were lovers of the lasting eternal as well as physical kind. Their love survived the guillotine, the trampling to death, and perhaps even death itself.